FULTON, NY – On the eleventh hour of the eleventh day of the eleventh month in 1918, a single gunshot signified the closing shot of the war after Germany and World War I allies signed the armistice that ended World War I. 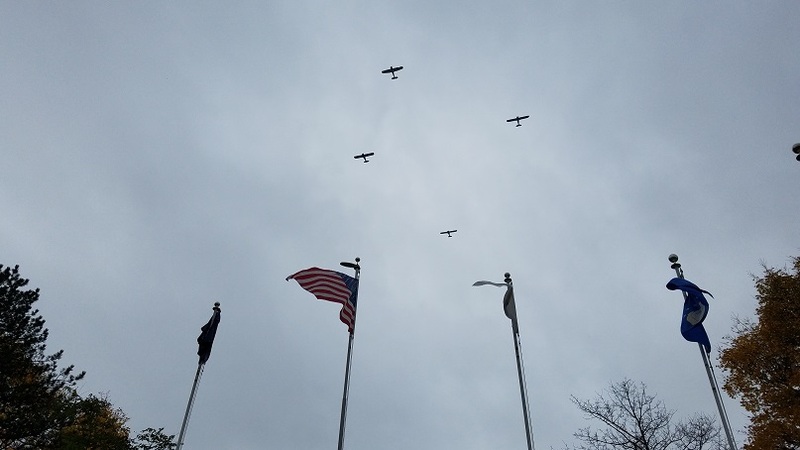 Now, 100 years later, the city of Fulton came together to recognize all United States veterans. Retired history teacher Pat Kush detailed the transition from declaring November 11 as Armistice Day to today’s widely recognized Veterans Day. “The world finally had an armistice,” she said. In 1926, the United States government declared November 11 as a legal holiday known as Armistice Day. “After WWII and the Korean War, in June of 1954, finally, Congress decided to change Armistice Day to Veterans Day to honor all American veterans,” Kush explained. She read the eighteen names of Fulton residents that gave their lives in World War I that are forever engraved in a monument at Veterans Park before a moment of silence in their honor. President of the Fulton Veterans Council Garry Visconti led a large crowd through the Veterans Day ceremony at Fulton’s Veterans Park before accepting his position as they 2018-2019 Veteran of the Year. “Whenever I come up to this park, look at this wall, I think about these veterans that gave their lives. Then you think about the veterans that served and came home, some with disabilities, PTSD, loss of limbs, and you think about the sacrifices they make,” Visconti said. He shared an all too common story, that of a veteran that committed suicide after serving their country and suffering through Post Traumatic Stress Disorder. “I’m thinking about some of the ways that veterans going without. Some ways I see that slowly changing, all you out here supporting this program is one way, but there needs to be other changes. We need to be more proactive with our veterans,” he said. He encouraged the crowd to get involved with local veterans groups, if they aren’t already. Although an ordinary citizen cannot be an active member without veteran status, a membership still garners support for the veteran group which is collected in data. “They are the key to our existence, and they need you more than anything in the world,” he said.